Having played at school with fellow Australian international Rocky Elsom, Richard Brown made his own international bow in 2008 when he came off the bench against the All Blacks in Brisbane. 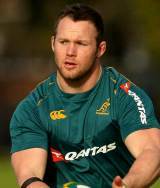 Having come to prominence with the fledgling Western Force in Super 14 competition, Brown's international career continued with starts against Italy, England and Wales on the Wallabies' end-of-season tour to the northern hemisphere. Following the 2009 Super 14 Brown was retained as one of a number of back-row options available to Robbie Deans, and he was handed a chance to show his versatility when selected on the blindside flank for the Tri-Nations loss to the All Blacks at Eden Park.